Regular guest poster, Jess Nichols of Sweet Eventide, weighs in on keeping warm in the winter. We moved into a rental last summer that fit almost all of our needs: it was in our budget, accepted our large dog and was within walking distance to my son's school. Check, check, check. Unfortunately, while it is the age of home we adore (1940s), it is showing its age a little too much. In fact, we are going to be the very last tenants in this home. When we move, it's going to be torn down. There are many things we love about this house, a few things we hate, and some things we love and hate. Take our family room for example: it is awesome extra space that we have never had before, 450 square feet that houses our television, home office and a table dedicated exclusively for arts, crafts and games (hello, dreamy). The family room was an addition to the house who knows when, and it was not built well or with insulation. In summer, it was roasting hot in this room, making it almost impossible to live in. Now that it's winter, it gets unbearably cold. Once upon a time, there was a wall furnace but our electricity company came out to inspect it for me in the fall and deemed it a hazard, promptly disconnecting it altogether. So I was on the prowl for an affordable, efficient heating solution since so very much of my family's living takes place in this room. I would like to introduce our new Eco Heater. It was easy to install with only four screws and a template that was included. It heats approximately 120 square feet (we have installed two for this room) and is mounted away from the wall to create a convection heat stream. It is totally silent and the company claims it costs less than four cents per hour to operate. We'll see when the first bill arrives. This may not be the *most* eco-friendly space heater on the market, but for our circumstances, I feel that we have made a good choice. We already got stuck with a lemon of an oil-filled space heater that went kaput. The manufacturer of that heater is bankrupt so now I'm faced with finding a way to dispose of it. That is obviously less than ideal. 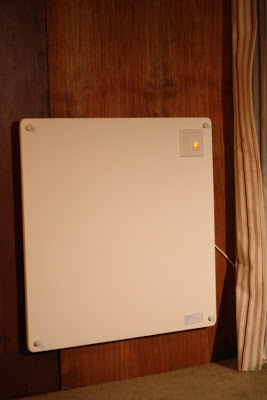 I am looking into adding a thermostat to each Eco Heater to make it even more efficient. A total bonus is the heaters can be painted, although in my case the white is a welcome contrast to the seemingly endless wood paneling. Do you mind if I ask what the Eco Heater costs? I would like to turn my heat down more but my 2 1/2 y.o. son wakes up 2 - 3 times a night even with blankets when we keep our house below 68. I can't deal with the sleep deprivation. We found them in a brick & mortar on sale for $108 each (normally $120). On their site, they have a dealers tab (which I found was not 100% accurate). You can find them online as well. We are going to install one in my son's room as well, I think it would work well for a kid's room. This would be perfect for a kids' room. We have a floor space heater in our boys' room now, and even though it has an automatic turn off feature if bumped, there's still the paranoia of some flammable object getting too close in the middle of the night. I'm hoping that by next winter all of my babies will be big enough that we can get by with warm pajamas and blankets, but if that doesn't work out, I'll have to keep this heater in mind. I didn't even know these existed! Great post, Jess. Wow Jess, it's so small! I will have to look into this... thanks! Peak Oil Hausfrau, what does your kid wear to bed? In winter (it's -16 F here tonight) my 4 year old wears long johns under footie pajamas, and it's really warm- in fact, when he crawls in bed with us in the morning he gets hot & pushes all the covers off everybody. We keep our house at 60 usually & the extra layer makes a big difference. My stepsister swears by a rice-filled heating pad, too - you microwave it 1 or 2 minutes and give it to the kids to snuggle up to. She says it's got her little guy sleeping alone for the first time - she gave us each one for christmas. Definitely keep us updated on its use, as this is a very intriguing product. In our old house my son's room was over the garage and was about 10 degrees colder than anywhere else in the house. We went through two space heaters in less than two years, because they both broke.